Fat Shopaholic: I'll be a Guess at the Spring into Summer Shopping & Styling Event! I'll be a Guess at the Spring into Summer Shopping & Styling Event! Get ready to shop, mingle and talk about summer fashion! 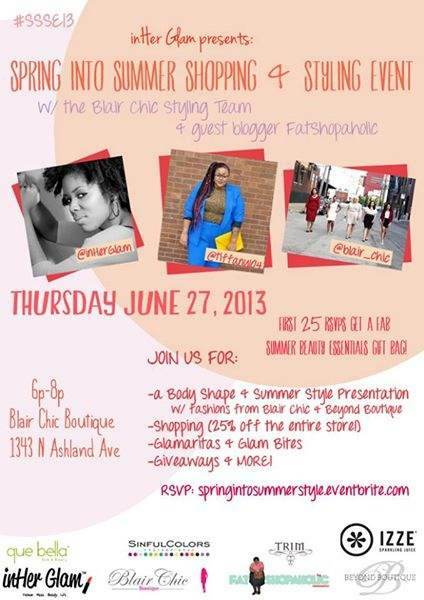 The Spring into Summer Shopping & Styling event is a free 2 hour event that will bring local Chicago fashion and beauty lovers of all shapes, sizes and backgrounds together to shop and talk about summer fashion and styling your shape. Enjoy Glam Bites, signature Glamaritas & more! The entire store will be 25% off so shop until you drop! That's 25% off both Blair Chic Boutique and Beyond Boutique! Bring your summer style questions for our summer style presentation featuring Eva London of inHer Glam, special guest blogger Tiffany Tucker of FatShopaholic and the Blair Chic styling team. Shop summer fashions from Blair Chic Boutique and Beyond Boutique! THE FIRST 25 RSVPs WILL GET A SUMMER BEAUTY ESSENTIALS GIFT BAG! We can't wait to mingle with the glam ladies of the Windy City! Questions? Shoot an email to info@inherglam.com. RSVP if you plan to attend, space is limited! I'm so excited to be attending this event and answering styling questions! I hope to see you there!